CSLB is one of the first agencies to respond during the recovery process after structures are destroyed from fire, floods, earthquakes, or any other natural disaster. 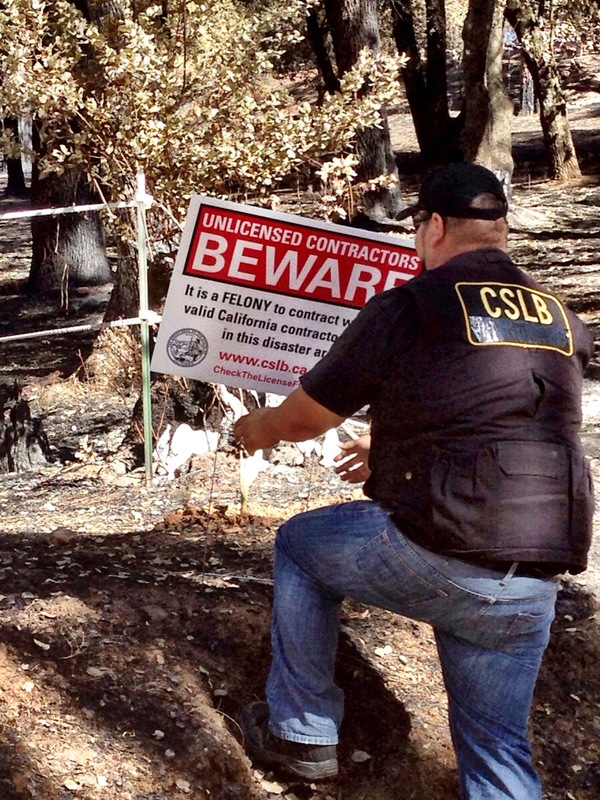 CSLB investigators were on the move in late September, traveling to fire-ravaged parts of Amador, Calaveras, and Lake counties, where thousands lost homes to the Butte Fire in the Sierra Nevada foothills and the Valley Fire in the Clearlake area. CSLB, along with representatives from the Department of Insurance, put "boots on the ground" at both disaster locations, meeting with victims and posting information warning against unlicensed contracting in the fire zones. CSLB staff also were on the scene in the aftermath of two destructive blazes earlier in Lake County, joining with other agencies as part of a disaster response. As a member of the Governor's Office of Emergency Services' disaster recovery team, CSLB participates at temporary Local Assistance Centers that are set up in affected communities. CSLB staff provides educational information about post-disaster contracting laws to property owners who will be looking for contractors to rebuild their homes and other structures. CSLB also maintains a Disaster Help Center section on its website, under the Consumers tab. CSLB is noticing a rise in incidents where unlicensed companies that advertise restoration or cleanup services are crossing the legal line into the kind of work that can only be done by licensed contractors. CSLB recently cited a San Jose restoration services company for unlicensed contracting in connection with a Santa Cruz-area home cleanup, illustrating the risks of taking on remediation projects without a contractor license. CSLB investigators had been called by a consumer who was concerned about a company's license status. A CSLB investigator discovered that a wall had been opened up and insulation torn out by the company representative trying to determine the extent of a mold problem. That would not have been an issue had the company held a license as a "B" General Building Contractor or C-61, D-64 Non-Specialized Contractor, which allows restoration contractors to make structural alterations to a property to perform necessary inspections, removals, and repairs. But the company was not licensed, and their representative's actions went beyond a non-invasive property cleanup, resulting in citations for unlicensed contracting and illegal advertising. Remember, the Contractors' State License Law considers any alteration of a fixed structure – be it removal of drywall, floorboards, carpets, or walls – as work that requires a "B" General Building or C-61, D-64 license. Unlicensed companies or individuals may perform restoration/cleanups as long as no structural work is involved, and the cost of the work and /or materials is less than $500. Given that structural remediation often calls for work beyond the surface layer to repair damage from flooding, mold, fire, or other disasters, it's advisable that companies that seek this kind of business possess a "B" General Building or C-61, D-64 contractor license and not risk violating the law.